Flamenco tablaos, also known as cafés cantantes, became popular during the mid-nineteenth century. These tablaos gave visibility to a dance form that otherwise would have gone unnoticed, unless one was part of a family or attended a family gathering where flamenco culture was their way of life. 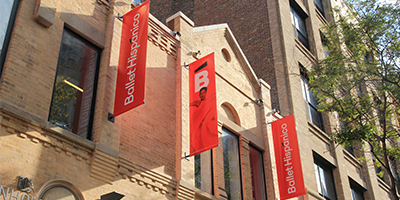 Ballet Hispánico’s tablao offers a warm, intimate setting where you can experience the form’s heartfelt songs, dance, and passion. In a tablao, seasoned dancers and musicians, who are well versed in the intricacies of the flamenco palos (suite of styles) and the eclectic musical heritage, come together to improvise, compose, arrange, and work collaboratively in the moment. The flamenco dancers may choreograph moments in a segment, but the majority of the performance is spontaneous, requiring all of the artists to function as a band and to be fully present.